Abstract: This talk introduces Learning2Gether (http://learning2gether.pbworks.com) and explains how it came about, and how it draws on and expands its participants’ personal learning networks so that knowledge is transferred informally and peer to peer. A crucial aspect of the learning that takes place there is where teachers model to one another how to use Web 2.0 tools to leverage learning through networking, and to apply these to classroom and other professional development opportunities. This talk is couched it in the perspective of how teachers achieve the aha! Moment, where they ‘get’ how technology can become a critical enabler of what they ordinarily try to do pedagogically in their classrooms. 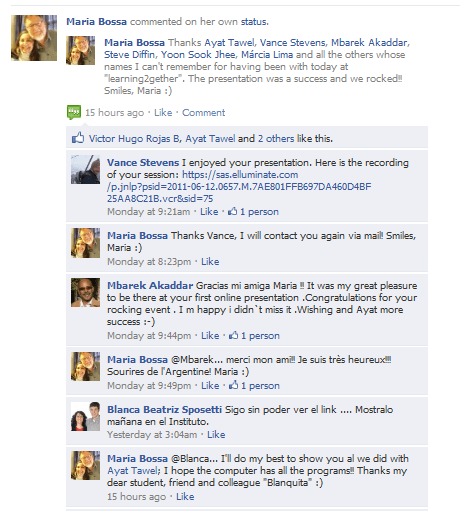 In this presentation I will try to provoke an aha! moment by illustrating how a PLN works to enhance such learning by getting people from other virtual spaces to join us in real time, live and online. Meanwhile, multitasking, I was trying to locate our scheduled presenter on Skype. I saw that Dave Cormier, whose work I’d referenced here, was online. 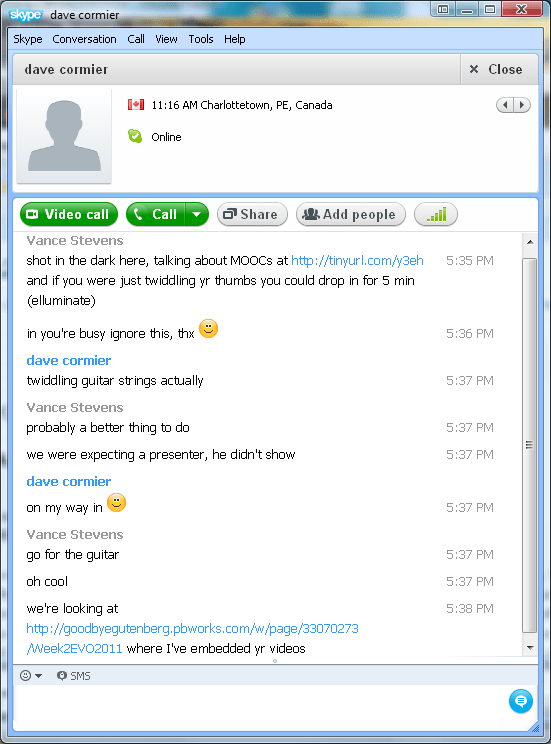 So on a whim I Skyped him, interrupting his guitar practice Sunday morning in Prince Edward Island, Canada, but he agreed to pop in and join us in Elluminate for a stimulating conversation. 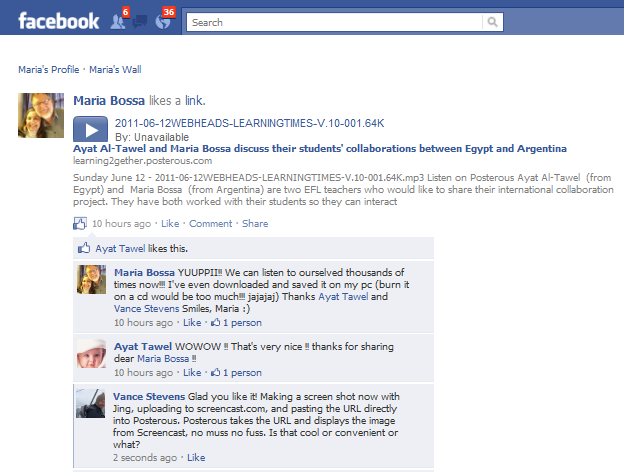 The result was an enlightened, spontaneous, recorded discussion, and the event itself serves to illustrate how a PLN works. James: no.. not familiar with it..
James: .. strange that I haven’t seen it..
James: is it in Beta ..
thought that if you hadn’t caught wind of it.. that you’d want to know about it. James: yeah.. it was the only link that I found to access the course..
but which can also be used to track formal learning (i.e. courses) where required. 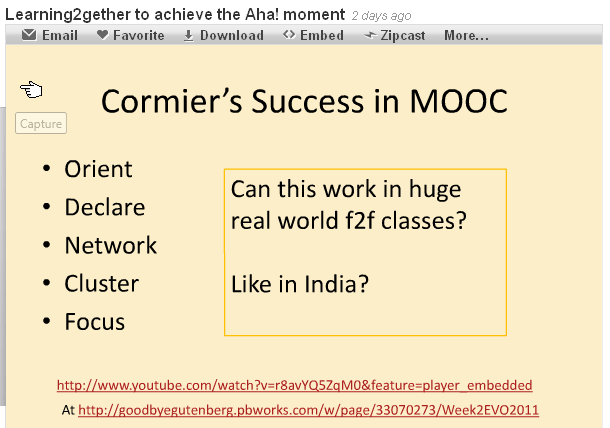 Vance: wouldn’t Moodle or Bb (properly implemented) do that? James: hmmm… not sure what Jane Hart would say to that..
James: happy to do so..
it’s my quota for May.. have to use it up quick..
James: I sense that its providing a tool rich environment for people to connect with first, socialize, share common interests.. and then design what they want to learn..
James: now you’ve got me curious .. need to check’em all out..
ok…. then there we go..
have registered to join Jane’s site.. to take in the Social Media course..
James: supposed to start today..
James: that’ll make two of us..
gotta get back to my real job ..